Insulation is a renovation topic that can be a confusing considering all the technical aspects involved. 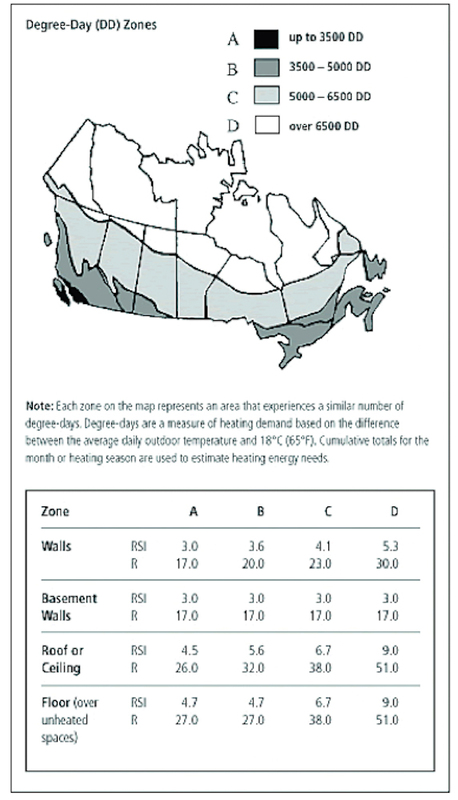 In this post, I will try to simply this topic to facilitate your decision making on insulation. Being in a Nordic climate, it’s important that we insulate our homes to protect us from the external climate. I think none of us like the idea of heating our streets vs. our houses. – for this reason, we need to understand how the building envelop of our home works? The building envelop primarily consist of Doors & Windows (D&W) and Insulation…In my previous post I shared on D&W…now let’s focus on Insulation. Similar to D&W, when insulating, we need to meet a minimum technical criteria to protect us from the Nordic climate. This criteria is called the R-Value, as seen in the diagram. The materials that are use to create the protective envelop of our homes have a nominal R-Value associated to them. By making the sum the R-Value of each material it will give the total R-Value of your exterior walls. Being in zone B, I need to be at a minimum R-Value of 20. How do you decide which one you should use? Assess what are you keeping (e.g: i will not redo the brick facade of my house). Based on your budget you can select between the different categories above. In my next post I’ll share how I made my selection for my house….In the meantime, you can read more on Insulation zoning reference.